Read how to improve the customer service experience. Learn 5 ways to modernise your IT service operation. Learn how SCL Health improved their fitness for service delivery. Are other departments still struggling with manual processes? Just like in IT, many business departments offer services and resources that can be created, requested or updated. Often the delivery of these services is hampered by many manual steps, difficulty connecting all the steps and lack of transparency to their status. The challenge is that manual model is no longer acceptable to employees and customers who expect a high level of consistency and quality with services, along with an engaging digital experience. Your IT department is well positioned to automate the services and offerings of other departments. Partner with them to leverage your ITSM tools and practises to develop and deliver new innovative services. See how Ivanti can help you improve service delivery beyond IT with our IT service management software. HR or Facilities are just one starting point. Other departments can design and automate end-to-end processes to connect themselves with the people who need and request their services. Simplify, automate and streamline routine activities while delivering a modern self-service experience. Businesses and organisations look to their facilities teams to provide services such as move management, repair work orders, preventative maintenance and general building management. Now model and easily deliver these service requests in a service catalogue powered by Ivanti. Providing great customer service and support is getting harder and more costly. Gain high levels of efficiency with automation to improve customer interactions and engagements, including a full suite of voice-enabled capabilities. Many HR departments currently use manual tools to deliver services such as employee on- & off-boarding, updating employee information, benefits, and payroll requests & administration. 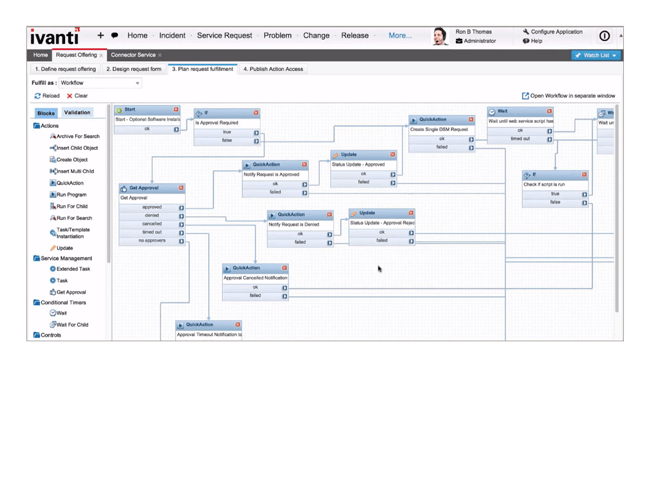 Streamline with Ivanti’s service automation platform and become more efficient. A modern service delivery experience doesn’t have to be limited to IT. All business departments need to become more efficient and proactive by transforming manual process currently driven by ad hoc emails, dated spreadsheets or paper documents. Do other departments come to you to learn how you’ve improved your service delivery? 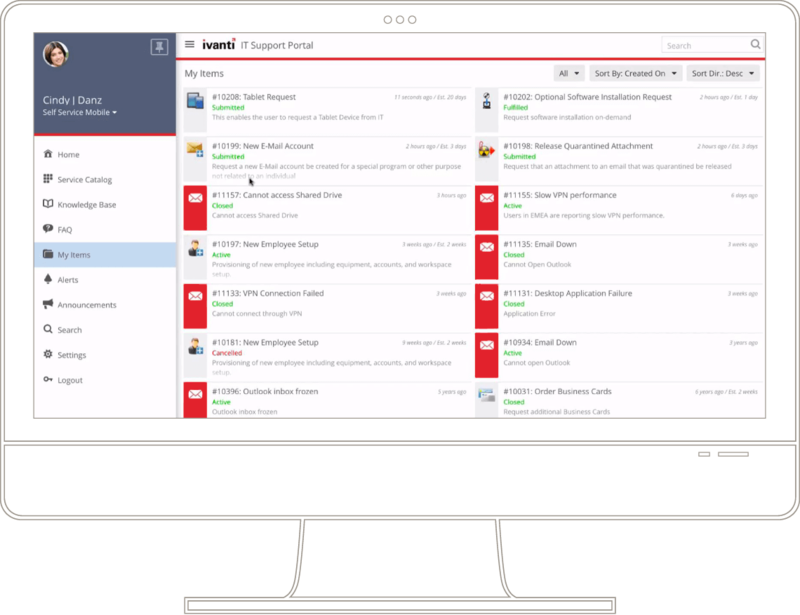 Your IT teams can help by leveraging Ivanti Service Manager to automate and streamline repetitive tasks, while improving user satisfaction with more self service opportunities thru multiple channels. Ivanti’s solutions are designed to help you improve service delivery experience and quality, while providing a foundation for ongoing innovation. Provide the engaging experience that users now expect for enhanced self-service, knowledge search, self-help and social collaboration anytime, anywhere. Make it easier to not only automate tasks and workflows within a business unit but also across other business units to streamline end-to-end processes. Use the automation and integration capabilities to increase effectiveness by developing new processes and workflows that support digital transformation across business units. Remove the potential for errors by standardising on a set of approved processes, workflows, and actions for more efficient and effective delivery. Better meet customer expectations by removing unnecessary manual and often repetitive interactions while providing increased consistency and insight into requests. Eliminate repetitive and manual tasks with workflow automation to free up your team to increase focus on important projects.